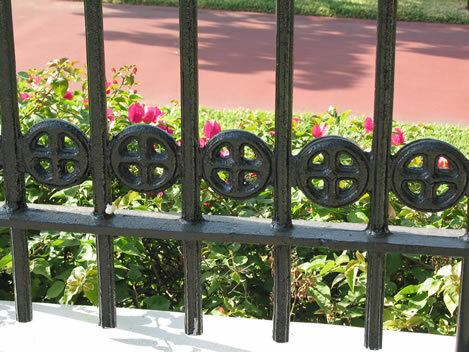 Many of the slaves that were brought to Jamaica came from West Africa and so the architect, Kamau Kambui, thought it fit to pay tribute to our ancestors by incorporating West African Adinkra symbols in the design of the Park. These symbols can be seen in various areas of the Park namely the perimeter fence, the walls at the entrance, the benches and garbage receptacles. The Adinkra symbols were originally designed by the Asante (Ashanti) craftsmen of Ghana, West Africa. They embody non-verbal communicative and aesthetic values, as well as the way of life of the people who designed them. The symbols incorporate images of humans, animals, plants and objects. Adinkra symbols are usually printed on cloth woven in Ghana. Traditionally, only members of royalty and spiritual leaders wore this cloth for very important sacred ceremonies and rituals. Today, the cloth is worn as everyday wear by the people of West Africa. In addition to being printed on cloth, the Adinkra symbols are used as decoration on pottery, paintings and other pieces of artwork. This symbolizes the oneness of the human family despite cultural differences. It is also akin to the words of the motto found at the bottom of the Jamaican Coat of Arms "Out of Many One People". The Futumfrafo symbol is engraved on two plaques located at the top of the stone posts at the ceremonial entrance of the Park. 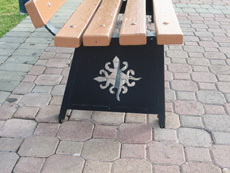 It can also be seen on the sides of the benches and garbage receptacles. This is a symbol of hardiness, toughness and perseverance as the seed of the Wafa tree is extremely hard. It is a symbol of one who is strong and tough, hence it represents the strength and resilience of the Jamaican people. 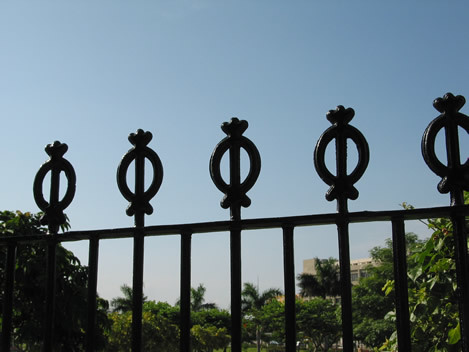 This symbol can be found at the top of the Park's perimeter fence. This is a symbol of love, safety and security. In West African culture it is believed that a house with a fence around it will make the family that resides in that dwelling feel more secure. The use of this symbol represents the fact that the emancipated slaves felt a sense of security knowing that they could now be with their families and they will no longer be separated from each other. 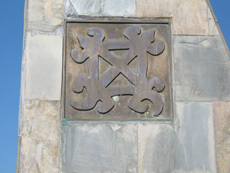 This symbol can be found at the bottom of the Park's perimeter fence.